Well, it’s finally come and gone. My last high mileage week of marathon training. As you are reading this, I’m starting my taper but let’s get into how the past week went for me! I did a full post on how this day went for me so you should go read that! But, in short, I had a great cross-training day of weights and spin class at the gym. But I did learn one lesson, I need to foam roll after spin class because my calves were so tight Tuesday morning. The beginning of this week was gorgeous (sunny and more seasonal temperatures) so I was excited to get out on some runs! I decided to move my hill repeats to Thursday (since it was going to be the warmest day so I wanted to do a harder workout then) so I just did an “easy pace” run….that ended up being marathon paced. I wasn’t even trying, I didn’t even look at my watch during the run so I didn’t realize how fast I was going until the end! It was almost fifty in Minnesota so of course I wore my Nuun singlet (for the first time) and shorts for this run! I started out feeling good (and running at marathon pace) so I decided to turn this into my marathon paced run instead of Saturday. Because we are supposed to get high winds and snow again on Saturday so I was planning a treadmill run versus causing hip pain again. I just nailed this run though and it felt amazing! 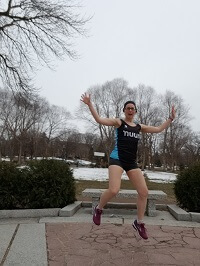 Another warm day (we hit 50 while I was running) so I headed out in shorts and a tank top again, plus my new Nuun running hat! It was cloudy so I didn’t really need the hat but I wore it anyways. I ran hill repeats and they felt awesome. No problems with any tightness or pain and it felt easy going up and down the hills. I could have gone slower but at least it wasn’t at race pace. I had a complete rest day today (except from walking Vinnie) since I had a work training all day long. I managed to hit my 10K step goal but I was so worn out that I decided to skip yoga. I just needed a mental break from the training. Surprise, surprise, we are getting a blizzard in Minnesota! Looking at the forecast, I was originally planning on running my twenty mile on Saturday but it was way too windy when I stepped outside. And it was good I decided to just move my runs to the treadmills since it was getting close to whiteout conditions when I got done with my treadmill run. At least it’s going to be good mental strength training and I’ll get to run in warmer weather! Running twenty miles on a treadmill wasn’t as bad as I thought it would be. It wasn’t a walk in the park but not as bad as I was thinking. I switched between episodes of Supernatural and a couple of podcasts plus Mike came in to workout for a little bit. But I’m in no mood to jump on a treadmill again anytime soon! And with that, I’m in the taper of marathon training. Which means shorter runs and getting prepped for the marathon!